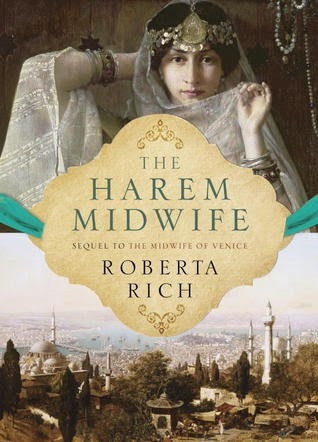 Last week I read The Harem Midwife by Roberta Rich, sequel to The Midwife of Venice. The plots of both these books were entertaining, but I especially loved the settings. Both take place in the mid-1550’s in first Venice and then Constantinople. Rich excels at creating scenes the reader can almost taste, smell, and touch. If this had been my own copy instead of a library book, many of the descriptive passages would have been dripping with highlighter. Her sentence construction is superb and airy. I struggle in my descriptive passages. They often sound repetitious or clunky. Until I get my own copy of the book, I’ll rely on the numerous sticky notes I have on the wall next to me with examples of Rich’s lovely sentences. When I’m writing something I can tell isn’t working, I turn and read one of her passages for inspiration. So, along with my usual fare of writing workshops, blogs and textbooks, my summer goal is to revisit some of my favorites: O Pioneers!, To Kill a Mockingbird, The Winter Garden, Girl in Hyacinth Blue. In the same way that Sword contrasts the beauty of the Ecclesiastes passage with Orwell's satirical rewrite, I want to study sentences, to dissect what makes great literature so beautiful to read. What books, writers or essays inspire you to work on your areas of writing weakness? What resources have you found to be especially helpful in your writing career? Pretty sure I'm in the "pompous and abstract category." Maybe the zombie nouns have already consumed my writely brain. Kelly, my editor at Five Star has been my greatest resource. I have learned more from her than all the dozens of writing books I've read put together. For inspiration, however, I still like Julia Cameron's "The Artist's Way." Oh No!!!! I fear I am a nominalizationer!!!! How's that for a noun? I love the show Game of Thrones and I just began reading book one. Fantasy is not a genre I generally gravitate toward but I am thoroughly enjoying this book. George R.R. Martin is a man who writes fantastic descriptions so my highlighter has been working overtime.